Blogging today has become one of the popular ways of making money online. Twenty years ago nobody knew the word “blog” and no one would ever believe that this kind of thing could make ordinary people into millionaires. So today we will talk about How to earn money from a blog and the top 10 bloggers’ earnings. Blogging initially involved a personal weblog, which is like a daily personal journal of a person every day. So, the term “Blog” is actually derived from “weblog”. As the technology creates more and more opportunity on the internet, many entrepreneurs discovered the huge marketing potential of having a blog, and blogging took off from there. Today, a blog is not only used for marketing but also, a blog can be a home business in and of itself. 1. Effective ways to monetize from your blog the right way. 2. 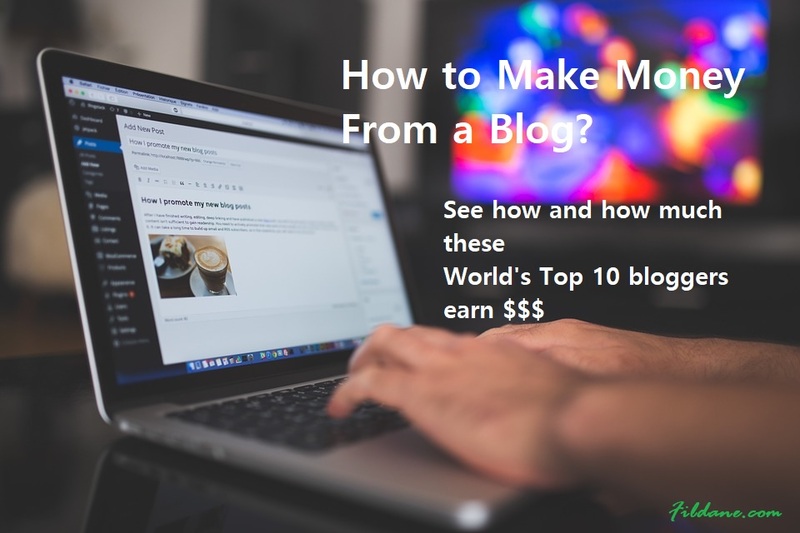 The Top 10 bloggers and how they earn money from blogging. 3. How to start your blog and achieve a financial freedom. Effective Ways to Monetize Your Blog Right Away. Making money through your blog is the most exciting topic. As blogging became popular, many people are still confused about what constitutes a blog over a website. Some people call it a blog site. And many online businesses use both, integrating them into a single web. Like any other business, it is difficult to make money right away when you first starting off. But online business is far advanced today that you can earn right away with your blog. Through affiliate marketing, you can attract your readers to buy other people’s products and earn a commission. There are around 550 online products to promote and earn huge income when you do it right. If you are an expert like with play guitar, piano, cooking, sewing etc. You can make an online course and sell it from your blog site and other online platforms. Otherwise, you can sell other people’s online courses from your blog and earn commissions by doing so. When you become a blogger, you will also eventually become an expert in your own niche. That way, you can offer people to become their coach or mentor, so you can guide them on how to do it step-by-step. And the coolest part, you set your own price. Bonus Tips: Sell products and services with recurring revenues to create passive and regular income for your blog. Reality Check: “Get Rich Quick Schemes” are SCAMS. The reality hurts sometimes. Getting hooked with the promises of getting quick results and become instantly rich are some of the things I experienced before I became a successful entrepreneur and investor. I’m sorry if you too have experienced it. But if not yet, remember that there is no shortcut to success in online business. Scams are everywhere. So please beware of those shiny promises – the typical scams. Your success as a blogger starts from hard work, persistence, disciple, and courage to work especially in the beginning. All successful bloggers today have done their framework and now they earn a jaw-dropping amount of money. So to be a successful blogger, you need be get inspired by those few bloggers who are at the position you’d like to be and take massive actions. It can honestly take from months to years before you achieve your financial freedom through online business. So start as early as possible. Just keep going even when it gets tough. Don’t stop. Loving what you do is the key to your success and building an empire of a profitable blog. Learn from bloggers with diverse backgrounds and expertise. Focus on what motivates you to build an online business. The next step? Take action and get started. Here Are The World’s Top 10 Blogger: See How and How Much They Earn. Michael Arrington is the founder of TechCrunch.com for the people who love technology news and articles. Arrington became the famous and the most influential personality in technology. So if you love technology, this could be your niche to your blog and become the next Michael Arrington earning up to $800,000 per month!. Pete Cashmore is the CEO and founder of Mashable.com. Cashmore was only 19-years-old when he started blogging in his bedroom in Scotland. Mashable cover about anything from technology and business to social media, lifestyle, and entertainment. He is now the youngest blogger millionaire in the world. So if you are as energetic as Cashmore – His footprints can be your right path. Mario Lavandeira, a.k.a. Perez Hilton is the founder of PerezHilton.com, which blogs about celebrity news, scandals and the like. His has been blogging since 2005 and now the on top-ranked celebrity blogger. If you love celebrity news, gossips and scandals, Lavadeira’s journalism’s style can be the best shot in your blogging career. Vitaly Friedman is the founder of SmashingMagazine, which is a blog for website designers. In 2009, he also started the Smashing Network to curate the best of other design blogs. Friedman’s income is mainly from advertising banners and doesn’t even include affiliate revenues. So, If you are a tech-savvy… you can be the next Friedman who can offer quality blogs with latest tips and guidelines with high-quality tutorials. Timothy Sykes‘ blog covers investment, finance, stocks and the like. Sykes is an expert when it comes to stock market investments and operations. He makes around $2 million a month from stock operations alone. So blogging is just his hobby but making him also one of the richest bloggers in the world. So if you already are successful and expert with something – this can be your people niche to your blog and earn even more money. Jake Dobkin is the founder of Gothamist.com, which articles cover about food, art, and events – globally. People who are traveling or planning a trip overseas and want to search for the local cuisines, Gothamist is a good blog to check. Gothamist covers around 13 cities around the world – started in New York and expanded in Toronto, London, and Shanghai. If you love traveling, food, places, arts, and events. Dobkins can be one of the inspirational bloggers in this niche. Collis Ta’eed is the founder of TutsPlus, which is a very informative blog for building skills that covers tutorials, lectures and different kinds of teaching methods in order to inform readers about application software and different designing tools. TutsPlus’ tutorials can help the readers from downloading a photo to mastering software applications. His blog is open for membership wherein members can also make money by contributing articles. So if you have a knowledge or expertise with software and applications. You can build the next money making TutsPlus than generates huge money month after month. Gina Trapani is the woman behind the Lifehacker.com blog. Aside from being the CEO and founder of the popular blog Lifehacker, Trapani is also highly active with social media and recently became a part of Gawker Blog Empire and Gizmodo. Lifehacker blog covers the ways to do things better and improving the ways in which one lives their life. Followers are encouraged to share tips and other new ideas in making everyday life a lot easier. So if you are very resourceful, artistic and creative, Lifehacker can be your inspiration to your blog and earn a lot of money every single month. Matt Marshall is the founder of VentureBeat.com. This blog started in 2006 covering worldwide technology. Aside from that Marshall has also developed a network of technology specialized websites. VentureBeat’s articles encompass not only technology but also about money, finance and investment topics. If you are good with technology and investment topics, you can build the next VentureBeat’s blog that can give you another great passive income. Ewdison Then is the co-founder of SlashGear.com, in which blog “geared” towards tech gadgets consumers – like iPhone, tablet, Ipad etc. SlashGear articles keep tech lovers in touch with the latest news about different and all kinds of technology and gadgets. Ewdison Then also works as a media publisher for his blog within the site and as a CEO of R3 Media LLC. Ewdison Then is also your man of inspiration when it comes to technology niche. How to Start Your Blog and Achieve a Financial Freedom. Imagine the freedom of working anytime and anywhere earning huge amount of money just through your laptop. Imagine how you can quit your day job because you already achieved a financial freedom. Great isn’t? This can be your reality if you start your journey now. Most of the successful bloggers above, are just ordinary hard working people (just like you) who believed that it was not impossible to achieve their dreams. You can be the next on the list after a few years. So what’s stopping you now? Join us at the world’s #1 Online Entrepreneur Community (Wealthy Affiliate), consisting of 1.4millions members with different expertise, who can help you all the way to your success 24/7. If you have any question on how to start a profitable blog, please feel free to post your comment below. An email address is required but it will not be shared with anyone, put on any list, or used for any kind of marketing, just to alert you if there are any replies. Goodluck to your journey to financial freedom and God bless. 7 Tips to Become Debt Free - Achieve Financial Freedom Fast. Investment Property Tips: Best investment? My Freelance Paycheck Review: Can You Earn $1-3K per month? I completely back your recommendation to join Wealthy Affiliate, the best community for bloggers and for business online in the world. Definitely with their training anyone can become as successful as these bloggers and more. Truly the Wealthy Affiliate is the best place to go. Hi Che, What a nice informative article you have. This gives me more insight about other ways to earn money online. Something I would like to consider as I am just starting online business. There one million and one ways of earning income online – Blogging is just one of the best ways. Hey Che, let’s hope in a few years time we remove a couple of these top ten bloggers and stand in their places, there’s a dreamy thought, but as you mention, it’s possible for any blogger to accomplish. I think the best way to blog is to write naturally, be helpful & informative with the emphasis on not trying to sell anything, you come across more trustworthy this way. Couple this with learning how to correctly optimize your website with the search engines, I agree, the world’s your oyster. You are welcome and Thanks for dropping by Simon. Truly our world is changing. Our technological advancements have made and will continuously make ordinary people well off with all the great opportunities in our time. I’m a newbie to affiliate marketing but writing used to be a tough task for me. Is there any training on blogging techniques in the Online Entrepreneur Community that can help me achieve my dream in earning online? You can join our online entrepreneur community and get started for FREE. The Online Entrepreneur Certification training level 1 and the Affiliate Bootcamp Phase 1 are designed for newbies (also free). I know you will love the community that truly cares for each other, especially the training courses, that will help you to improve your writing techniques, SEO and How you can monetize your online business. Hello Che, thanks for this post. As the doors would say “You lit my fire” (in an appropriate way) today! I simply won’t give up. I won’t. I glad it helped to lit the fire in you – There is nothing impossible with Hard work, persistence, and determination. Great article. The whole get rich quick scheme is a scam. However, hard work, persistence, and guidance with a program like Wealthy Affiliate will pay off. And wow, the top 10 blogger’s earnings are jaw-dropping! It’s certainly a reminder to stick to the program! Thanks. That is true Susie. There are a lot of people who get blinded by quick results and end up being scammed. Yes, the Wealthy Affiliate definitely works. Just keep it up and be persistent. Glad you find the site useful for tips and advice.